Eight of us had a great day at this fantastic reserve although the early risers definitely got the best pickings. It was a particularly high tide that morning with the sea coming right up to the sea wall (apparently this only happens about four times per year). As a consequence, those arriving at 08:30 got views of 5 Marsh Harriers and a Short Eared Owl. They were also lucky enough to see several Spotted Redshank and Curlew Sandpipers and a Little Stint. Oddly enough, the reserve was rather quiet from the visitor point of view but there was plenty of avian fauna to get to grips with. 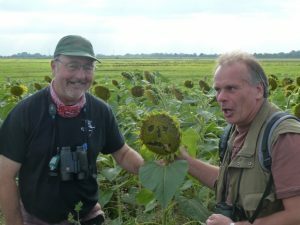 All in all, the group identified 67 different species with the highlights being large flocks of Goldfinch and Linnets which were enjoying themselves on the sunflowers that have been planted around the reserve, a large flock of Common Snipe, returning Brent Geese, a solitary Wheatear on the sea wall, a Green Sandpiper identified in flight and 5 or more Yellow Wagtails. 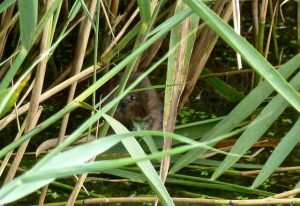 The part of the group that missed out on the owl, were however, rewarded with a lengthy close up view of a water vole munching upon a phragmites leaf. This entry was posted in Trip Reports, Trips. Bookmark the permalink.